Whenever you write a post to your website, you allways have to find, relative keywords, but you also have to find keywords that users are using mostly. Normally if you do this process by manually this is takes like 5-10m for each post, with keyword finder you can do that in seconds. Easy to use, no configration needed. Whenever you type a title on wordpress, Keyword Finder automaticly searchs most relevant, highest search volumed keywords and displays in seconds. With this keywords you can target more users for your website. You can add them as tags, or keywords. Keyword finder brings you most highest search volumed keywords, you dont have to worry about “am i picking correct keyword ?” All done by Keyword finder. Keyword finder supports 189 lagnuage, including hard languages like thai, chinesee. 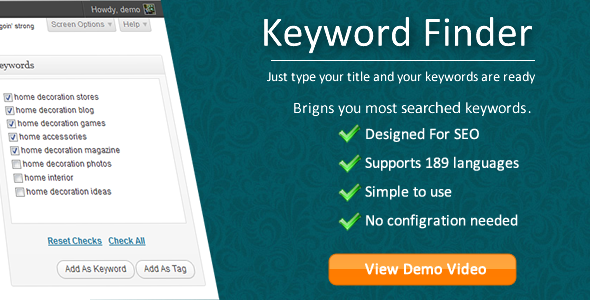 Share the post "Keyword Finder for WordPress"